CHICAGO – In our latest comedy/drama edition of HollywoodChicago.com Hookup: Film, we have 50 admit-two passes up for grabs to the advance Chicago screening of the new film “Solitary Man”! The film from writer and director Brian Koppelman features Michael Douglas, Susan Sarandon, Danny DeVito, Mary-Louise Parker, Jenna Fischer, Imogen Poots, Jesse Eisenberg, Richard Schiff, Jake Richard Siciliano, David Costabile, Ben Shenkman, Anastasia Griffith, Alex Kaluzhsky, Simone Levin and James Colby. “Solitary Man” opens in Chicago on June 11, 2010. To win your free pass to the advance Chicago screening of “Solitary Man” courtesy of HollywoodChicago.com, just answer our question below. That’s it! This screening is on Tuesday, June 8, 2010 at 7:30 p.m. in Chicago. Directions to enter this HollywoodChicago.com Hookup and immediately win can be found beneath the graphic below. 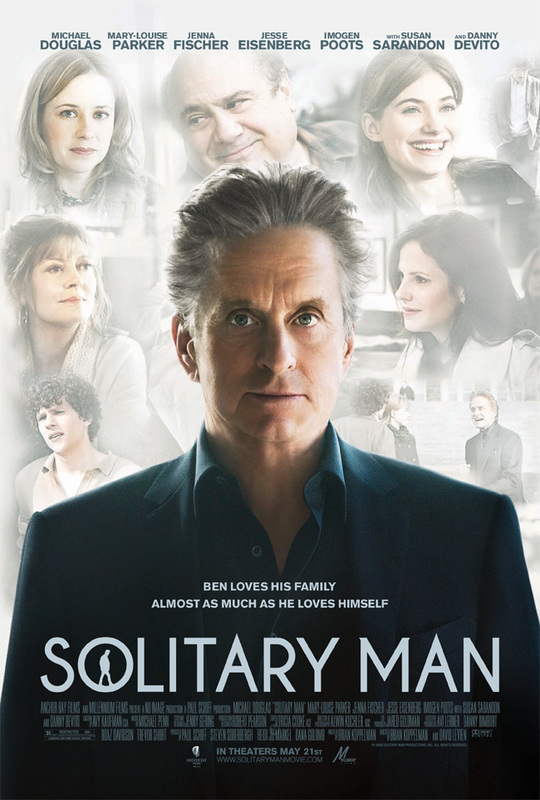 The movie poster for “Solitary Man” with Michael Douglas. “Solitary Man” tells the story of Ben Kalmen: a 50-something New Yorker and former successful car dealer who – through his own bad choices – lost his entire business. When the film opens, Ben’s on the verge of a comeback, but some of the same motivations that led to his demise are threatening to take him down again. He’s divorced from Nancy. She’s his college sweetheart and the one person who knows him better than anyone. Though he still finds the time to hang out with his daughter, Susan, and his adoring grandson, she breaks off contact when she discovers he’s seeing one of her friends. His girlfriend, Jordan, is the daughter of a very influential businessman who’s on the board of a major automobile manufacturer. If Ben can just keep his hubris in check for a little while longer, he will be back as big as ever. But circumstances place him in very close proximity with the one girl he shouldn’t touch, which throws everything into jeopardy. “Solitary Man” is directed by Brian Koppelman and David Levien from Koppelman’s original screenplay. Paul Schiff and Steven Soderbergh produce with Avi Lerner and Moshe Diamant from Nu Image. The film stars the Academy Award-winning actor Michael Douglas (“Wall Street,” “The Wonder Boys”) as Ben Kalmen. Susan Sarandon (“Thelma & Louise,” “Dead Man Walking”) heads up the supporting cast in the role of Ben’s wife, Nancy, alongside Jenna Fisher (“The Office”). She plays Ben’s daughter, Susan. Mary-Louise Parker (“Weeds”) plays Ben’s Upper East Side girlfriend and newcomer Imogen Poots (“28 Weeks Later”) plays her daughter, Allyson. Rounding out the supporting cast is the upcoming young actor Jesse Eisenberg (“Zombieland”) and the award-winning actor Danny DeVito (“One Flew Over the Cuckoo’s Nest”) as Jimmy. The trailer for “Solitary Man” can be watched now below. How do you balance your personal life with your professional life? Like all Hookups here, this HollywoodChicago.com Hookup is simple: Just submit your comment below and we will award 50 people randomly via e-mail for our “Solitary Man” Hookup. Winners need to arrive early as seats are consumed on a first-come, first-served basis. Good luck! Submitted by matt (not verified) on June 7, 2010 - 8:23am. Submitted by babygirlaj25 on June 7, 2010 - 8:39am. I struggle at times with balancing my professional life with my personal life, but I try to play as hard as I work. Submitted by paisley_reign on June 7, 2010 - 9:36am. this film has a great cast. should be interesting. new to chicago — would be great to get passes and possibly meet new people. Submitted by Snavab on June 7, 2010 - 10:13am. As a grad student, I have an extremely hard time balancing the two. There are only so many hours in the day and most of them must be spent reading and writing. Submitted by Hendrix on June 7, 2010 - 11:05am. Someone once said, “if you enjoy what you do, your work becomes your play ” I would add that if you are able to involve those you care deeply about, you may have found the proper balance. Submitted by candylandchicago on June 7, 2010 - 11:11am. Keep work and personal separate. I devote a certain amount of time to your family, friends, and whoever I’m dating. Work is important and people should understand, but I make sure to make time for people who are important to me, and I don’t talk to them about work at all. Submitted by ghostbuster on June 7, 2010 - 11:34am. The profesional stays in its own place just has the personal it doesn’t combines. Submitted by megancpa1@yahoo.com on June 7, 2010 - 6:41pm. “it’s complicated.” It can be done by being organized, saying no when necessary & not trying to do too much or doing everything perfectly. Submitted by icoastpat on June 17, 2010 - 6:55pm. I am a Libra. and if one side is off whack, I balance it out. Submitted by icoastpat on June 17, 2010 - 6:56pm.